The Catalina 34 reflects the experience of Catalina owners, who proved the practicality of the masthead rig with fore and aft lowers, forestay and backstay. The inboard shroud base leaves more room for secure footing on the non-skid deck and provides for narrow sheeting angles and the ability to carry large genoas. The rigid boom vang and double ended mainsheet system make sail handling easier and more secure. 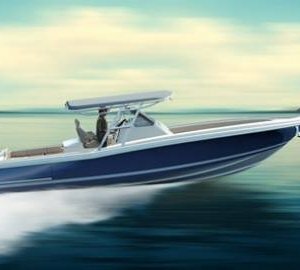 The new wider aft cabin has an even larger berth, upholstered seat and new bureau. Rates shown above are for 7 days/6 nights. 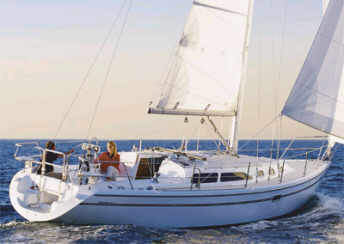 The Catalina 34 has two private double cabins, one forward and one aft. The forward cabin is a V-berth formation. The salon settee converts to form two more berths on the starboard side and a single on port, if necessary. As there is only one head with hot and cold shower, we ideally recommend four people for a comfortable charter. The Catalina has classic slab and roller reefing, one wheel steering, VHS, DPS, depth sounder and an electric anchor winch. There is a bimini and dodger, an ondeck shower and BBQ, a tender with an outboard, AM/FM radio & CD player, fully equipped galley with LPG stove & oven, fridge/freezer, pre-charter cruising guides, full boat and chart briefing.